Megan Brashear, CVT, VTS (ECC), demonstrates how to obtain blood to perform a PT and aPTT bedside clotting tests in a dog. 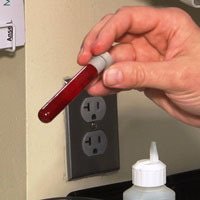 If there are not two CoAg machines available, what would be the process at that point since the blood can't sit in the syringe due to clotting? Would you just put the sample in a blue top tube (citrate) and then run the test from there?